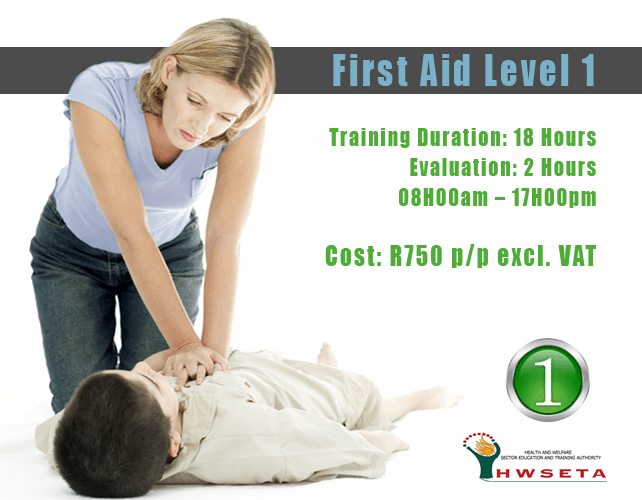 First Aid Level 1 Training in South Africa. Get A Free Quote Today! First Aid Level 1 is a very important course. In Level 1, you learn to do a lot of the practical elements you will be learning more theory on in other levels. We consider First Aid Level 1 to be the most important out of the three levels. First Aid Level 1, although the most basic out of the lot, will me more than adequate to save a life. This is the recommended course by the department of labour. In First Aid Level 1 , you will learn to do the basics practically. This ensures that you have enough knowledge to cover basic injuries. This included bleeding, fractures, burns and CPR. In Level 1, you will learn exactly how to administer CPR to a patient that is not breathing. This means that the first aider will be able to assist in the event of drowning, heart attack and suffocation. When it comes to bleeding, you will learn to treat basic wounds and more serious wounds. It’s vitally important to stop bleeding as soon as possible. This will limit the severe effect shock has on the body. Objectives of First Aid & Basic Safety. First Aider Safety / AIDS. Examination of Unconscious & Conscious Patient. Basic First Aid Equipment OHS Act 85 of 1993. Risks in Your Particular Company. This First Aid Level 1 course will be ideal for employees, teachers, tour guides, teenagers etc. For young parents, nannies and high risk work situations, we recommend level two or higher. Please note that you can combine levels for a reduced price. To get a First Aid Level 1 Training Quote, please complete our contact form. We will contact you with all the details. With this course, we can accommodate individuals & groups of any size. We can also do an assessment of your workplace to ensure that you have adequate first aiders and a functional health & safety system.